ESPN have released their top 100 players in the world this year – or ten per position: Goalkeeper, Right-back, Left-back, Centre-back, Centre-midfield, Attacking-midfield, Wing-forward, Forward, Striker and Manager! 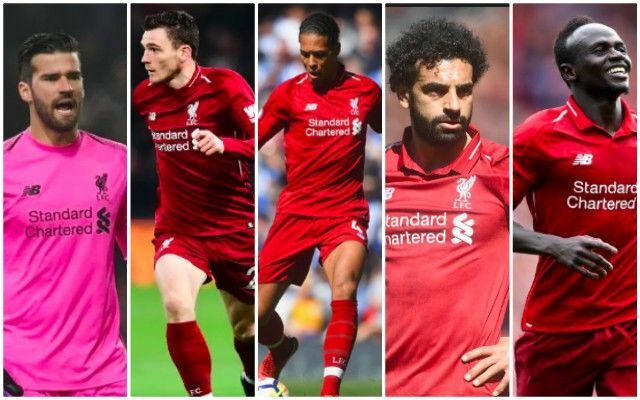 Six Liverpool players have been included in the various categories, which suggests our first-XI is actually jam-packed with world-class operators. Alisson is named the world’s 4th best keeper, Virgil van Dijk the 4th best centre-back, Andy Robertson the 8th best left-back, Sadio Mane the BEST wing-forward, Mo Salah the 7th best forward and Roberto Firmino the 9th best forward! Firstly, we’re delighted Robbo gets a mention as his unglamorous name often sees him left out of such lists, but in 2018, there’s been few better left-backs on the planet. We’d suggest van Dijk is currently above Diego Godin certainly and potentially Sergio Ramos and Rapha Varane as well. Mane’s rated higher than Raheem Sterling and Leroy Sane, which we like, although we’d probably put Salah in the wing-forward category and have Liverpool’s stars as no.1 and no.2. After all, Salah played the entirety of last season from the right and some of this. Alisson’s rating seems fair right now, although Firmino will need to keep scoring goals as he did on Wednesday to keep being mentioned with such illustrious company. Interestingly, ESPN name Jurgen Klopp the world’s second best manager behind Pep Guardiola, ahead of World Cup winner Didier Deschamps, for one.